Since the 1970s the discussion around promoting and supporting the continued use of Inuktut (the Inuit language) in schools across Canada’s four Inuit regions has included a deeply rooted debate about introducing a unified Inuit writing system to promote communication across dialects and the development of common learning materials. We can take ownership of our written language. Our current writing systems were introduced through the process of colonization. The unified Inuktut writing system will be the first writing system created by Inuit for Inuit in Canada. Why Create a Unified System? The key to a new era in bilingual education is the ability to produce, publish and distribute common Inuktut materials. A unified writing system for Inuktut with common grammar, spelling and terminology, would facilitate the production of these materials and strengthen Inuktut. It would improve mobility and foster consistency in the education system for students, leading to improved literacy and education outcomes across Inuit Nunangat. A unified writing system will also strengthen Inuit unity and culture in Canada, as it is part of Inuit self-determination. 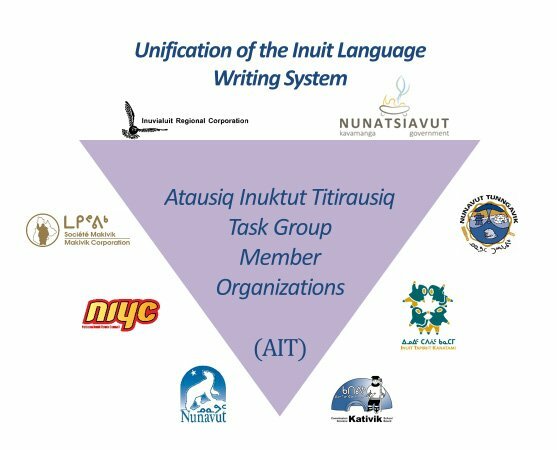 The Atausiq Inuktut Titirausiq (AIT) Task Group includes language specialists from each Inuit region. It is mandated to research and identify the speech components of Inuktut and the current Inuktut orthographies in use, and recommend an Inuktut orthography that has the best chance of advancing Inuktut far into the future. Many Inuit learned to write from Inuit who were visiting from other regions and writing spread quickly. Inuit improved and adapted the writing systems that missionaries developed in order to spread Christianity throughout the Arctic. Are there areas in history of our writing systems that are not identified in the timeline that should be considered to develop the unified writing system? Are there key symbols or clusters of symbols that are common across our region and should be considered in a unified Inuit language writing system? Land claims organizations, language authorities, and governments will make their own decisions for moving forward. Is there any additional information that should be required before a recommendation is provided?